These nutty Low Carb Chocolate bars use monk fruit powder as a sweetener and are extremely creamy and delicious. They are guaranteed to stop any sugar cravings you may have! I started experimenting making keto chocolate the first day I got cocoa butter last year. We went to visit the Glico chocolate factory at work and I remember they showed us a video explaining how to make chocolate. They would combine cocoa butter with cocoa mass (unsweetened baking chocolate), sugar and milk to create their delicious chocolates. My first recipe that feature cocoa butter was my Matcha Chocolate Fudge. It’s flavoured with creamy cashew butter and Japanese matcha. They were inspired by my favourite chocolate in Japan, but I made them sugar-free and dairy-free for myself. I decided to try my hand at making homemade chocolate bars. 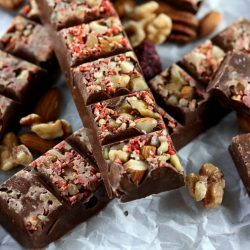 I make different bars from time to time but had never uploaded an actual ”chocolate” recipe until today. 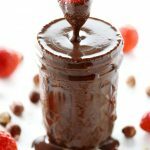 I figured that since Valentine’s Day was coming up in a couple of weeks, I could upload one last keto chocolate recipe for the season. I’ve experimented making low carb chocolate using different dairy and non-dairy products, from their dried forms to their liquid forms. I much prefer making the chocolate with liquid, heavy cream or coconut cream, as opposed to dried milk like coconut milk powder, buttermilk powder or skim milk powder. The powder always leaves the chocolates to have this sort of grainy and sandy texture that I really don’t like, whereas the liquid doesn’t really do that. 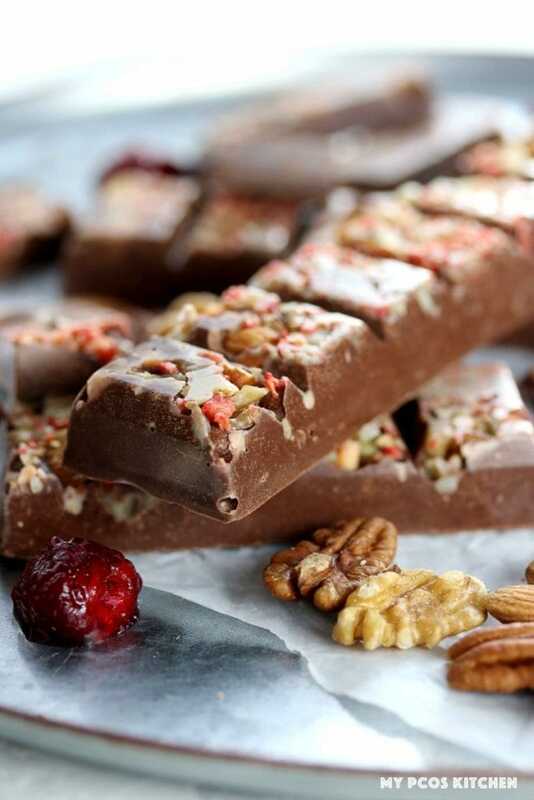 By using liquid, you can ensure to have nice and creamy keto chocolate. I also experimented making this low carb chocolate with different sweeteners. I really don’t like using erythritol as it doesn’t cook or melt so it usually stays somewhat grainy. My favourite sweeteners for low carb chocolate so far are stevia powder and monk fruit powder. You can substitute them for one another in the same ratio as they pretty much have the same sweetness. I personally love to add different fillings to my chocolates. 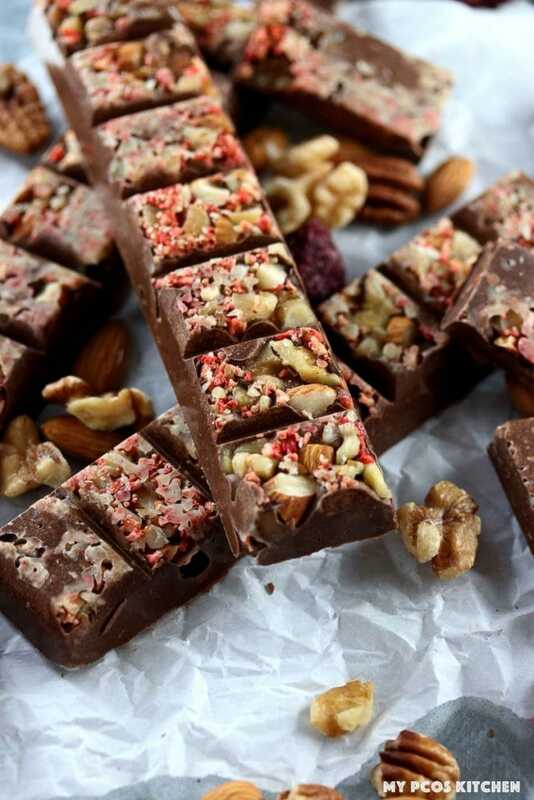 In this recipe, I added different kinds of nuts with some freeze-dried raspberries. 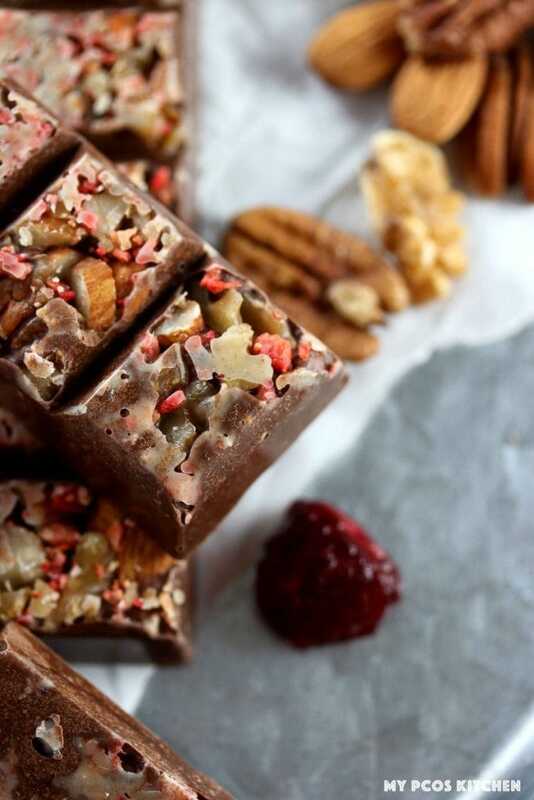 The nuts provide the crunch, the raspberries a bit of sweetness and colour, and the chocolate the creamy chocolatey flavours. Giving the chocolate its shape is my ultimate favourite part. I bought about 15 different kinds of chocolate silicone molds on Amazon to make fat bombs and homemade chocolate bars. You don’t have to buy silicone, but I find it’s easier to take them out than plastic. Once you have your preferred shape of mold, you just need to pour the chocolate liquid into each mold. Depending on how much dairy you put in, the chocolate paste may be thinner or thicker. In this recipe, I used quite a lot of heavy cream so the chocolate is definitely on the thicker side. I just use a knife or spatula to spread the chocolate over in each mold and ensure that each hole has enough chocolate. Feel free to decorate as you wish. I added the nuts and raspberries to the bottom of each hole in my molds, but you could also mix the nuts and fruit with the chocolate and then pour it in the molds. If you don’t want to use molds, you can always try making my Raspberry Almond Chocolate Fat Bombs that are also dairy-free and sugar-free! For that recipe, you simply need to spread the chocolate mixture over some parchment paper and freeze for an hour or so. 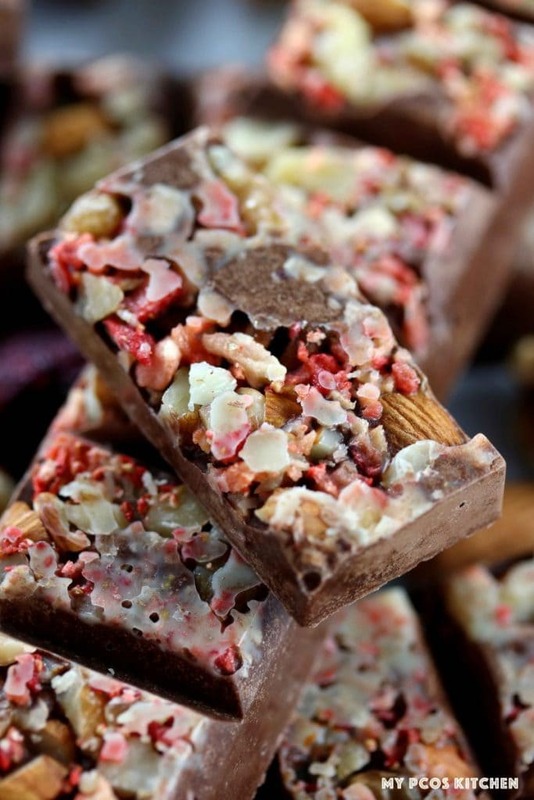 Delicious creamy chocolate filled with nuts and freeze dried berries! Chop all of the nuts. Mix the nuts and raspberries in a bowl together. In a double boiler, add the cacao butter and unsweetened baking chocolate to a bowl and let melt on low heat. Once it is completely melted, take the bowl off the heat. Add the monk fruit and whisk in. Pour the heavy cream and whisk until nicely incorporated. The chocolate cream will be a little thick. Add the chopped nuts to the bottom of the molds of your choice. I used two different kinds for this recipe. I used a silicone mold with 24 small cavities, and a silicone mold with 3 large cavities that made breakable bars. Once you have added your nuts, spoon in the chocolate into each mold until completely filled. Make sure to fill them to the top and to level them out with a knife. Once filled, place them in the fridge to cool for 3+ hours. Once cooled, then can be eaten whenever! I prefer to store them in a plastic bag or tupperware inside the fridge to prevent them from melting. They keep for about 2-3 weeks depending on the freshness of the heavy cream you use. But they're usually long gone before that. You can also keep them in the freezer for about a month, completely sealed and covered. I made about 24 small chocolates and 3 large chocolate bars which equals to about 42 small chocolates in total. For the whole batch, it's 3845 calories, 384g fat, 76.46g carbs, 50.1g fiber, 39.52g protein. Hi it’s pure monk from julian bakery. Oh my GOODNESS! I just made the chocolate with the ingredients I had at home. It’s sooooo delicious. I only made half the recipe, and used powdered Swerve for the sweetner, because that’s what I had on hand. I split the melted chocolate into 3 batches. In one batch I added a couple of drops of orange essential oil in it, and added a few craisins. One batch I added chopped pecans, and the other I left plain. Oh my, they are so good. This looks delicious! Could i use cacao powder in place of the cocoa mass? It’ll be more oily as cocoa mass is actual unsweetened chocolate. If you use cocoa powder instead, it’ll become a pretty oily fat bomb, and the cream will not mix with the cocoa butter, they will separate. The cacao mass helps the cocoa butter and cream stick together. 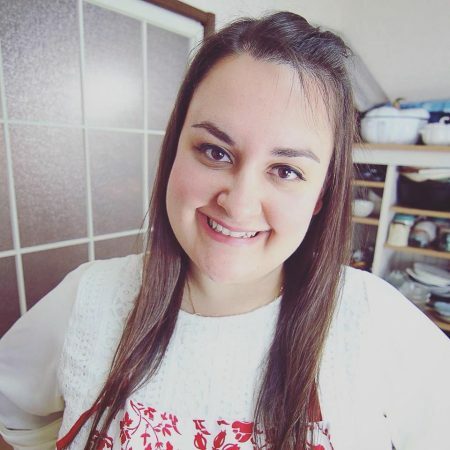 Hi Gina, you can link to my recipes no problem, but I don’t allow copying and pasting the recipes and blog post. Hi Miska, I just added the link! 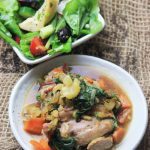 For this recipe I used the one from Julian’s bakery! NuNaturals also sells some online. I bought both versions on iherb but they sell some on Amaazon too. 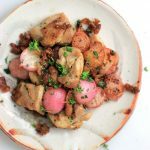 Cette recette est tellement bonne! So good. I freeze them in my after I vacuum seal them separately.